2007 – ADI release shocking footage of cruelty at Colombian circuses, with support of local group Mentes Verdes. 2007– We take legal action against one of the worst perpetrators of circus cruelty, resulting in the surrender of abused chimpanzee, Karla. 2008 – ADI awareness campaign on circus cruelty achieves massive political, media, celebrity and public support, assisted by our partner groups. 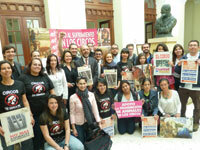 2010 – We present Stop Circus Suffering campaign in Colombian Senate. Colombian authorities prosecute worst offenders of circus abuse. 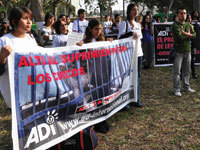 2011 – Thousands march with ADI in Bogota, as animal groups unite to demand a ban on animals in circuses. Bill to ban all animal circuses introduced in lower chamber of Congress. 2012 – Bill to ban all animals in circuses finally passes with unanimous vote in the lower house and moves on to Senate. The capital, Bogota, bans all animals in circuses. ADI provides Congress with new evidence of cruelty in Colombian circuses. 2013 – ADI launches a nationwide tour to raise support and awareness for ban. Senate committee amends draft bill to ban wild animals in circuses. Bill submitted to Congress for vote.